Welcome to Creeksong – Perhaps the most idyllic location on Fightingtown Creek in Cashes Valley near Cohutta Wilderness access. A lush mountain paradise – the sound of whitewater will tickle your ears from the moment that you step out of your car! 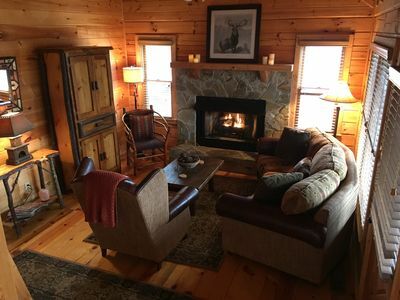 Creeksong is cozy for couples and big enough for families too. Complete Renovation in 2013. Walking in to Creeksong you will find yourself in a large great room with leather furniture, flat screen TV with DVD and SAT. 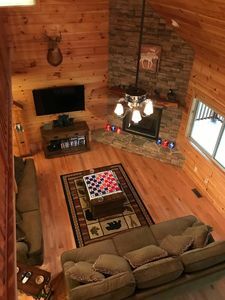 This room is set up to relax and entertain featuring a gas log fireplace, lots of family games, books and pool table. 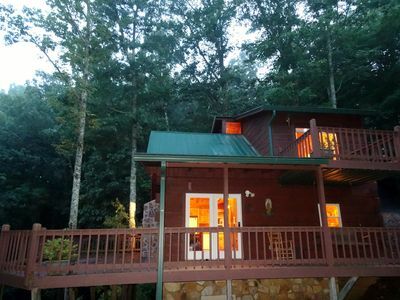 Just off the great room you will find a screened in porch with an in-deck hot tub that is virtually surrounded by the creek as it bends around the cabin. 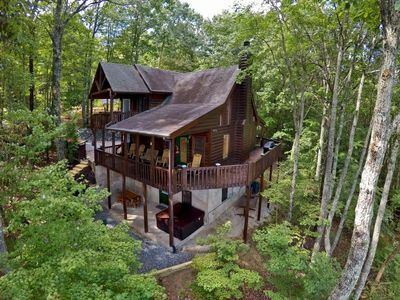 Three steps up above the great room is a fully equipped kitchen with dining table for 8 and access to a covered porch and views of the creek. The entry level has a large full bathroom located between the great room and the stairs to the bedrooms on the upper level. Upstairs offers two large suites and a sleeping loft. The master suite has a spacious parlor sitting area with picture frame windows, large balcony overlooking the creek below and a king bed. 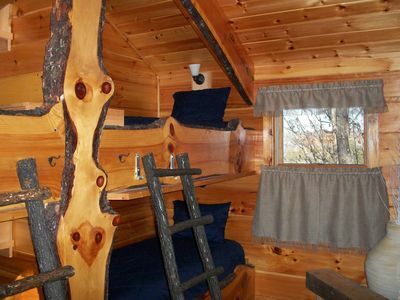 The sleeping loft (accessed through the master suite) offers two twin beds. 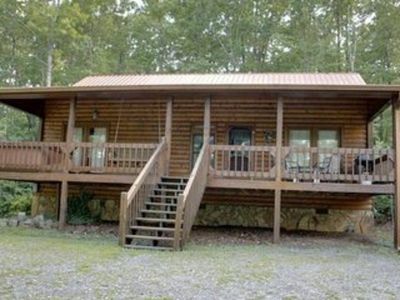 Suite two is large room on the front side of the cabin that offers a king bed. Both bedrooms have access to grand master bathroom with a tub/shower combo and double vanity or the second full bathroom downstairs can be used by the second suite. 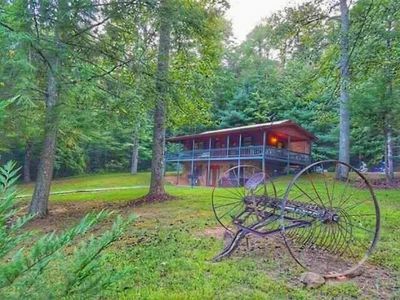 Creeksong sits in seclusion just 35 feet from the famous Fightingtown Creek(30-40 feet wide and 3-4 feet deep in fishing holes) yet is just minutes from both Blue Ridge and Ellijay. 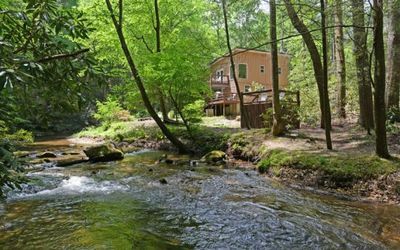 Creeksong beckons you with almost 1000 feet of rushing creek frontage- a true paradise! 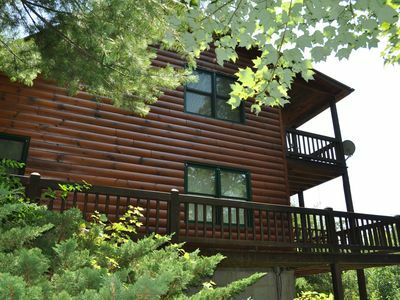 Explore your way through almost 3 acres of pristine forest wonderland – Giant Hemlock and White Pine tower above you while Rhododendron and Mountain Laurel create outdoor hallways and rooms that you can discover as you go. This is a setting you’ll want to return to again and again – discovering something new upon every return! 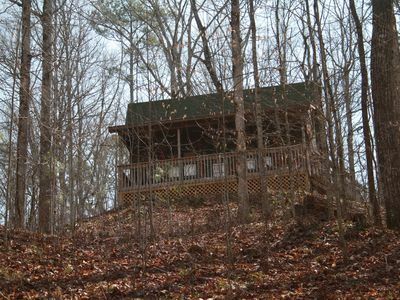 Sleep in unique bunkbeds & stare at majestic Damascus Peak 15 miles away in NC! !!! !Scenic Ridge has gorgeous MOUNTAIN Views!!!!!!!!! 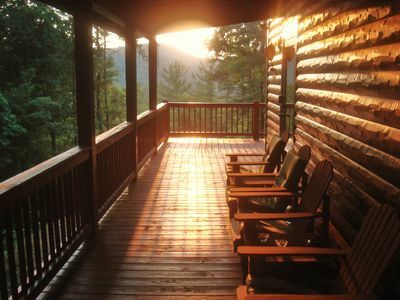 Cozy cabin, mountain views, large deck, hot tub-Leaves are changing! 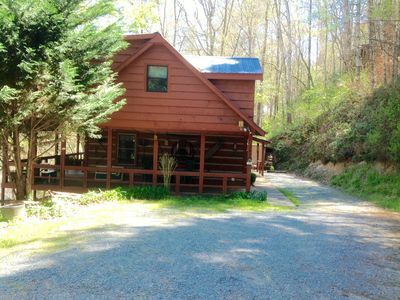 Located 5 Minutes From Downtown Blue Ridge! 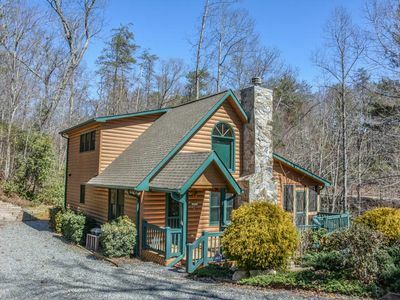 Less than 7 mins from Downtown Blue Ridge! Make beautiful memories and enjoy the nature all around you! The American Dream!